if all you want is lights to work, can you just pop it open and wire up the lights to a 12v source? at least this is what my first thought would be. my second thought would be to get one of those 12 and 24 pin connections from a junk yard and a wiring diagram for it. then hook power to the right leads and it should function as well. these would be my first 2 attempts anyway. If you work at a dealership, you can probably discover a service manual for that car. This will lead you to the wiring schematic. Which will lead you to identifying the power and ground pins on the cluster. Provide power and ground, and lights! Or, get a string of LED christmas lights. Take the cluster apart, drill relevant holes for the xmas lights, glue them in. that's an interesting thought as well. could even have the colors change and all that coolness depending on your mood. 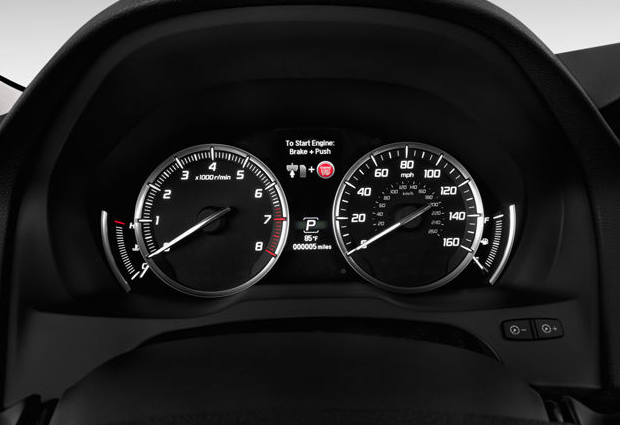 This being a 2015 Acura, I expect a lot of the dash blinken lights are computer controlled digital. Not sure how much discovering the 12v input will do. Or even the xmas lights thing. that;s what i wondered as well. hooking up power may not be enough. some of the stuff may have been controlled by a switch elsewhere and may need to be "triggered" to come on. like for instance when headlights are turned on, this often turns on some back lighting for the instrument cluster. wiring diagram may be helpful here to identify how to trigger some or all of them. or what other things have to happen to get all the lights to come on and how that is represented to the cluster. think I could somehow power it with a computer power supply if I supply power to the right pins? This is what you're looking at? A computer PSU is overkill here. All you're looking to do it turn on some light bulbs. If those actually exist in there. It looks like this is analog gauges with actual movable needles? It is basically just turning on LED's, I dont even need the needles to move. I just need to know what pins to supply power to. There are other images on google images if you just google "acura part 78100-STX-A61" It shous the back where the connections are. Moving the needles requires varying voltage, in this case, controlled by the car computer. Does it need serious investigation? Again, yes. Far more than just a simple 12v input. i'd ask the guys in the shop that work there to look up the wiring diagram for you real quick. they have access to much better stuff than i could google. would take them a minute to print the page for you and then you can power the right leads.